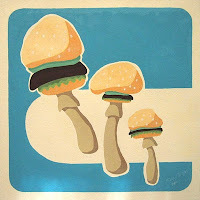 This is a super slick stencil style painting of charmingly cartoonish burger-mushrooms in a 1950's colour palette. Thanks to the Japanese anime style painter Madoka Kinoshita for inspiring the clean crisp lines and patience required for this piece. She recently did a three part video series of her painting methods which I found fascinating. It left me itching to try this style again. Now after completing this piece, I really know that while I enjoy the results, I really don't enjoy the process. Next time I try a stencil style piece, there will be changes to the method! I found that I am actually quicker and at least as accurate painting freehand rather than using a cut out mask. Who would've thunk? Don't be fooled by the simplicity of this 'recipe'. It's bloody delicious. And in the middle of winter when you're craving something fresh, yet warming and filling, this really hits the spot. I'm still searching for vege burgers of the pattie variety that can match these ideas. So it's really easy and involves only 4 ingredients for the entire burger, with two variations. Yes that is it and they are divine. As I said, don't underestimate how delicious these are just because they are so simple.